No Pressure Washers are used to clean your roof, safe and effectively. For most of us, a home is the greatest investment we’ll ever have and keeping the roof in good condition prevents future costly repairs. Moss will root in your composition roofing causing it to fail before the actual warranty life, costing thousands in re-roofing costs. Many times, contractors immediately tell home owners the only option is to replace a roof regardless of age, when cleaning can correct the problem at a fraction of the cost. 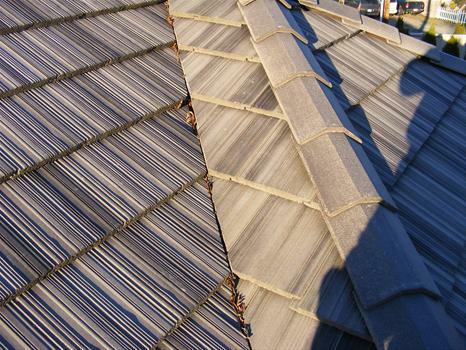 We provide a wide range of roofing maintenance, services within a 150 mile radius of Shelton, WA. Servicing: Mason, Thurston, Pierce, King, and Kitsap counties. If you or someone you know needs roof cleaning, tile roof leak repair, or roofing maintenance, contact us and we’ll discuss your options. We give our customers honest answers to questions they have concerning the roof over their head and that’s what sets Richards Roofing Service apart from the rest. One part of the home that sometimes gets overlooked is the interestingly enough one of the largest parts, and one that has more visibility than many others, especially in this age of satellite imagery. Your roof is an integral part of making your home stand out versus those in your neighborhood surroundings. The only real problem is that a roof has a tendency to be rather high, and as a result we don’t really have a major desire to get into that position. As a result the roof tends to be overlooked, it just sits up and gathers dirt, moss, leaves, dust, grime, and pretty much anything else the wind can blow in it’s direction. This is where the roof sometimes winds up becoming your one major weak point on your checklist for a perfect home. Over time the nastiness that develops on your roof just gets worse and worse, sometimes making it almost unbearable to look at the mess. Nobody wants to live in a mess, the reason we work so hard to keep everything looking good is nearly biblical, after all we’re always told cleanliness is next to godliness aren’t we? Removing the filth that cakes your roof is important, so rather than risking a fall by getting up there yourself there is a company that will do it all for you, Richards Roof Service. From standard roof repairs to moss removal services, even gutter cleaning services when needed, Richards Roof Service will take care of every one of your roof cleaning needs. It doesn’t matter if you need a few shingles replaced, or just to remove the hazy film that’s developed over the surface from years of rain and snow, they take care of everything that could ever come up when it comes to keeping your roof in perfect order to match the rest of your exquisitely manicured property. Richards Roof Service can take care of virtually any roof surface when working on your home and making things look how you prefer them. They specialize in tile, shake, as well as composition shingle roofs. 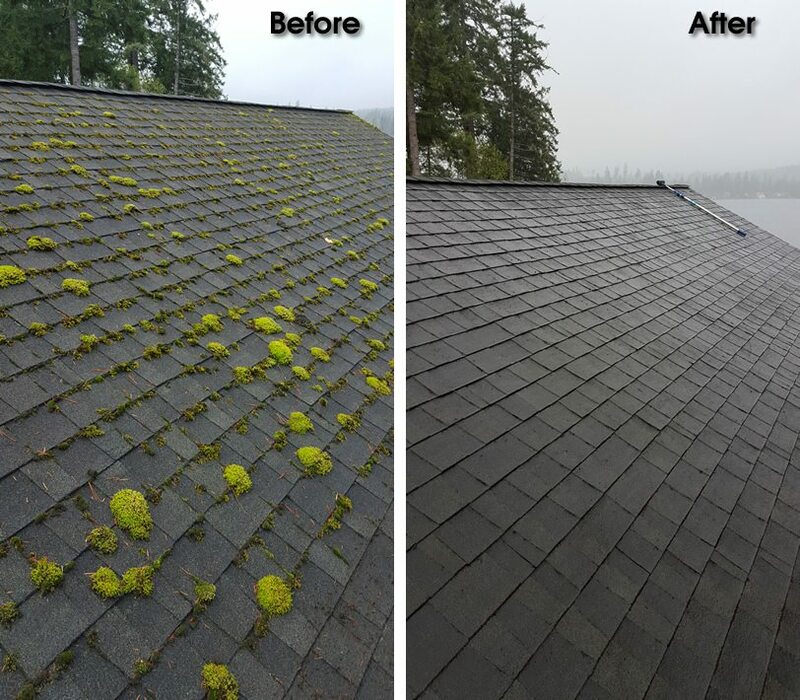 They are also experts in algae, moss, mold, and mildew removal utilizing different methods to get your roof back to a brand new look and feel. Richards Roof Service also uses spray treatments to remove the muck that’s been growing above your head. While they do offer pressure washing treatments, they won’t do this on your roof, doing so would only cause larger issues and is never recommended. If you’re ready to get your home back to brand new, call Richards Roof Service today. Covering areas around Gig Harbor, Sequim, Olympia, Tacoma, Puyallup, Centralia, Port Orchard, Bremerton, Silverdale, Bonney Lake, University Place, Bainbridge Island, Poulsbo, Auburn, Seattle, Lakewood, Lake Tapps, Poulsbo, Allyn, Ocean Shores, Washington – WA, they are always within range almost any time. Richards Roof Service is here to take care of your needs, contact them today to get your project rolling. Customer service is their specialty, they’ll treat you right.